Since graduation Lisa Cook has achieved a lot. 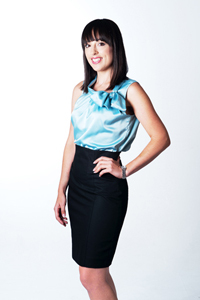 She has founded Get on Board Australia - an organisation focused on developing and educating new and aspiring board members and company directors - and has sat on the boards of a community bank, an inclusive sports organisation, a national sporting organisation, and a Sydney-based family business. She also finds time to mentor final-year university students in Adelaide, works as a youth mentor with The Smith Family and has been invited to join a regional business leaders group. These are just some of the many achievements of a young woman who earned her business management and marketing degree while working full-time and commuting five hours a day. Here we learn what keeps Lisa motivated. I was the first in my immediate family to attend university...Personally it meant a lot to me to have the opportunity to complete a degree. I grew up in a single parent household in the Western suburbs of Sydney and being accepted and completing a degree via distance education was certainly a huge accomplishment and something that my family is very proud of. I chose CSU because…of the high reputation of the distance education program and because a former boss of mine, who I have a huge amount of respect for, earned his degree through Charles Sturt. My best experience at CSU...has to be the moment I received my acceptance letter. Graduation day was also important - thinking of being up on stage in my cap and gown kept me motivated through many late nights and summer weekends finishing assignments. My worst experience at CSU... was being awarded a “did not complete” final grade for my financial management class. Thankfully it was a mistake caused by a missing mark from an assignment. I ended up getting a credit for that subject, which more than made up for the initial error. At university I was inspired…to run a business and to use business to make the world a better place. Today I’m motivated…by helping others to recognise and realise their full potential. In my profession it is important to…have an enormous level of integrity. It’s about doing the right thing even when no one is watching. The biggest influence in my life...is the drive to make a positive impact on the world by creating better businesses through developing great business leaders. My greatest achievement is...graduating in five years, instead of six. Missing two summers was worth it! In the future I’d like to…grow my business, Get On Board Australia, and continue to make a positive difference in the local community and beyond. I believe that businesses led by capable, confident, and compassionate people can have wide-reaching, positive outcomes. I liken it to the ripple effect – one little action can cause a thousand ripples. The topic I Tweet about most is...leadership and any other business-related topics on my personal twitter (@lisamcook). My business twitter account (@GetOnBoardAUS) is full of tweets for new and aspiring directors to help them build their corporate governance, business acumen, decision-making, and leadership skills. The best piece of advice I ever received...was from one of my first bosses. She told me that, “for any business you work in, work as if it’s your own business.” Do that and you’ll be an out-performer wherever you work. If I could do it all again I...wouldn’t change a thing. Even the crappy parts have given me perspective and the ability to help others that I may not have otherwise developed. One last thing...a couple of things that hold true time after time: through hard work, commitment, and perseverance you can achieve anything. And, you are the master of your destiny – create it, don’t wait for it to happen on its own.